Holds 8 portrait 6x4" prints back to back per page, that's a total of 80 prints per pack of 10. 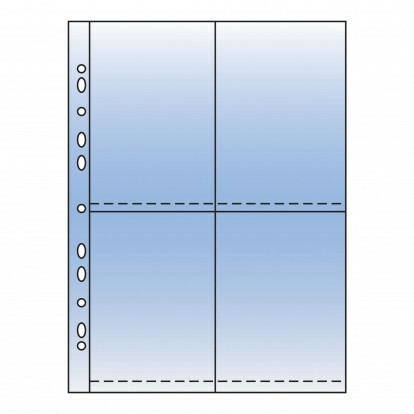 For other Standard sized Photo and Document Refills Click here. Polypropylene is a simple plastic polymer which is inexpensive to produce, has a huge variety of applications and is often used in flexible packaging and food containers due to its protective and non-reactive properties. You can see why it is the choice of many for long-term archival storage, and it has formed the basis of the Arrowfile Storage system. There are a couple of points you may want to keep in mind though, its clarity is not as good as Polyester (which is also more expensive to produce). Polypropylene can also be degraded by UV light over time: however as most contents also need protecting from the light, if they are both stored inside albums and slipcases, this is not likely to be a problem. As an in-ert, inexpensive, durable option this is the choice of most Arrowfile customers.